Are you in Pain? We want to help you Stop the Pain ASAP. Huntsville Al Chiropractors, Millar Chiropractic - Huntsville AL (Downtown) is our clinic that specializes in Pain. If you're in PAIN, we can see you today (in most cases) . Tell the office when you call that you're in Pain and need to be seen today . Call now (256) 539-2000. The Millar Chiropractic - Huntsville AL (Downtown) clinic is right off the South Parkway at the Clinton Ave Exit. In fact when your take the South Parkway Clinton exit the exit ramp road circles our building. We're located in Suite A. At Millar Chiropractic - Huntsville AL (Downtown) we treat from Arthritis to Whiplash but specializes in 6 areas: 1) Low Back Pain 2) Neck Pain 3) Headaches & Migraines 4) Sciatica 5) Joint pain (hips, knees, ankles and feet - shoulders elbows carpal tunnel and hand) 6) Personal Injury cases. 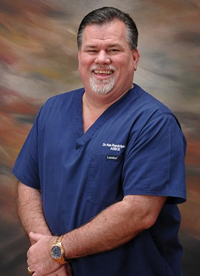 Dr Ken Randolph, DC Chiropractor is one of the Senior Millar Chiropractors at Millar Chiropractic Clinics. He sees patients by appointment in Huntsville. Dr Ken is a former member of the Alabama State Board of Chiropractic Examiners who regulate and enforce the laws governing Chiropractic. It is a rarity anytime in our profession to have a fourth generation Chiropractor. We are proud to announce that we have such an individual, Dr. Ken Randolph. Dr. Ken can trace his Chiropractic roots back to the family who started Chiropractic in 1895. Dr. Ken is a graduate of Life University. Dr. Ken has practiced for the past 16 years in Guin, Alabama with his father, Dr. Gary Randolph, who has been in practice since 1960. Dr. Ken is a participating provider for BCBS, Fed BCBS and Medicare and accepts most insurance. Dr. Greg Millar, DC CCEP | Chiropractor, Founder & CEO of Millar Chiropractic Clinics. 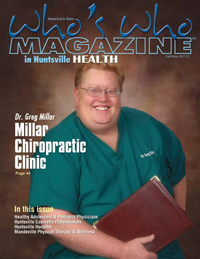 He practices at Millar Chiropractic - Huntsville AL (Downtown) on an appointment basis. He specializes in treating functional medicine. He treats IBS, fibromyalgia, chronic fatigue, viral disorders like Lymes, He is also a Certified Extremity doctor holding the CCEP designation. Dr Millar is known for his diagnostic "rock turning over" "find the root cause" practice. Dr Millar likes to say, "If you don't really know what is causing the problem, you can't fix it." Dr Millar invented the "Millar Facet/Stenosis Table" with the "Millar Facet Protocol" to treat Facet pain from degenerative facet disease, facet arthropathy, and facet syndrome. He uses light force adjustments, disc pumps, decompression traction, core stabilization and other physiotherapy to treat bulged and herniated disc problems. Dr Millar practiced for years with the neurosurgeons of UAB Dept of Neurosurgery handling their disc and facet cases before and after surgery. For failed back surgery syndrome, another one of Dr Millar's specialties, Dr Millar uses the Cutting Edge MLS M6 Robotic Laser. "There are four classes of lasers approved by the FDA." Dr Millar went on to say, "I personally think that the top of the line is the Class IV, Cutting Edge MLS M6 Robotic Laser with up to 25watts of peak power non burning lasers. This Laser appeared to be light years (pardon the pun) ahead of all the others. It had to do with the MLS system where they lock or sinc multi lasers simultaneously at multiple frequencies with pulsed and continuous beams all at once. The research is remarkable on this MLS Robotic M6 Laser." Dr Millar is not a participating BCBS or Medicare provider. He has a cash practice. He will gladly provide you with a superbill to send to your insurance company. 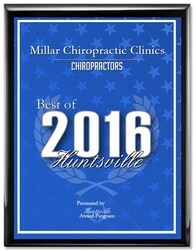 Millar Chiropractic Clinics was recipient of the 2015 and 2016 Best of Huntsville, Chiropractor award. 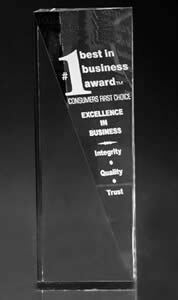 We were also awarded the #1 Best in Business Award, Chiropractor for Huntsville and North Alabama for five years running 2011-2015. But the award we most covet is being your Chiropractor and helping YOU get out of and stay out of Pain. Office hours 8-12 PM 2-6 PM. New Patients Welcome.